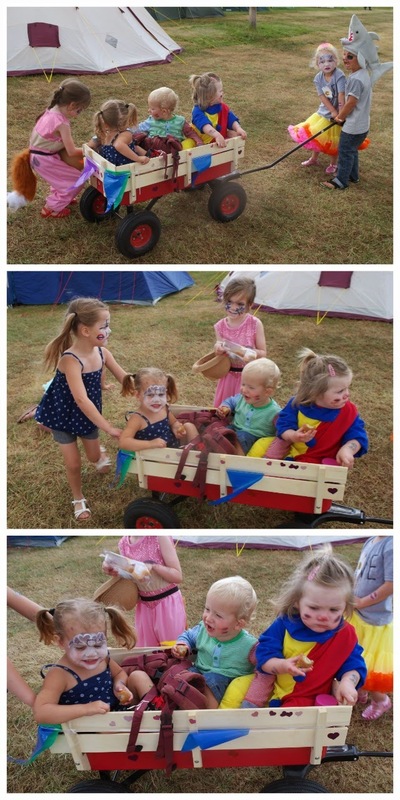 When I got back from Camp Bestival last year, the one thing I knew for certain was that we would be taking a wagon with us when we went to our next festival. 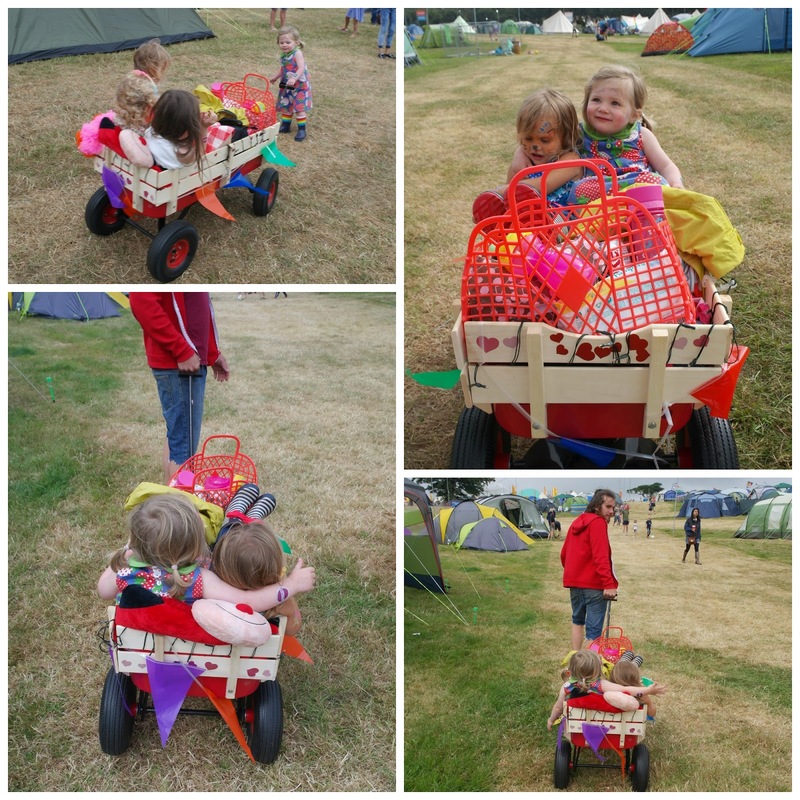 We'd taken an off-road buggy with us that time - which was great - but we wanted something that both girls could hitch a ride in, and also something we could use to help us cart our camping gear from car park to camp site! I had no intention of being a fair-weather festival wagoner either! I liked the idea of a wagon generally; something we could use in the garden or when going to the meadow for a picnic to carry all our picnicky things. 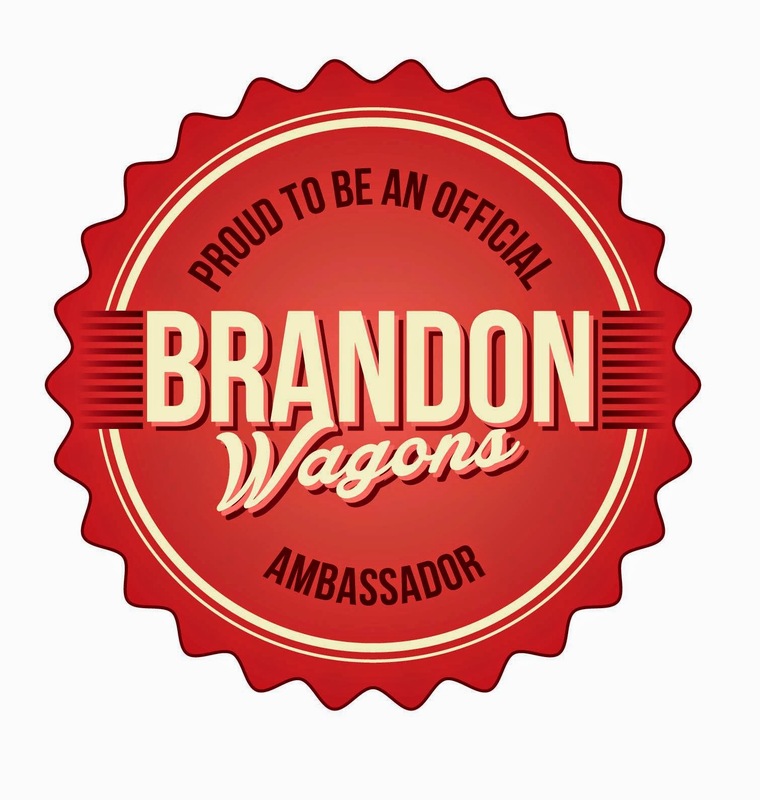 We were thrilled to be announced as Brandon Wagons Ambassadors earlier this year, and even more excited when our wagon arrived the week before Camp Bestival! It required some assembly (which I confess I had no part in ;)) but the husband put it together in less than half an hour while us girls went to the Cupcakery in town and that suited me just fine! When we got home the girls insisted on being taken out for a test ride straight away and we headed off up the road, receiving compliments from every single person we passed. Before we became Brandon Wagons Ambassadors I'd looked at other brands of wagons but, in all honesty, it was Brandon Wagons that I liked the most; and this mostly because of the size. I drive a Mercedes A-Class, which has a notoriously tiny boot and, with all the other camping and baby paraphernalia we'd be taking with us to Camp Bestival, I worried that we wouldn't be able to fit it all in, plus a wagon too! I needn't have stressed about it though. It fit in our boot completely perfectly - and we didn't even have to remove the handle as we'd expected which was brilliant. Once we arrived at Camp Bestival, it really came into it's own. It's able to carry up to 300lbs at a time so we loaded it up with our bits and pieces and made our way down to the camp site. After just two trips (compared to the four we made with the buggy last year!) we had all our gear with us and were ready to set up home for the weekend! Then, of course, there was the whole reason we were so keen to get one..... to cart the children around! We were camping in a group of 16 (8 adults and 8 kids) so there were plenty of rides to be given. Generally we let the littlest littlies ride in it (Evie, who is 21 months, and her friends Jimmy, aged 27months and Orlaith, aged 33months) although everyone had a go - and the best bit of all was that the bigger kids liked to pull it! With that being the case, its fairly obvious that these wagons are super easy to pull and steer, and they also have ten inch pneumatic wheels with grips on the tyres that, I am told, make it perfect for use in snow, as well as on rough terrain (I can't WAIT to try this out come winter!). The size of the tray was perfect for both Daisy and Evie to curl up and snooze in at the end of a long, busy day at Camp Bestival. We lined it with cushions and took a blanket for them to snuggle up in and that's exactly what they did - every night we were there! 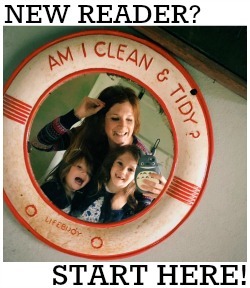 We are completely head over heels in love with our wagon and can't recommend it highly enough! It's a super versatile piece of kit and we couldn't be without it now. Brandon Wagons retail at a very, very reasonable £65 plus P&P and are available here. thoughts are true and our own.